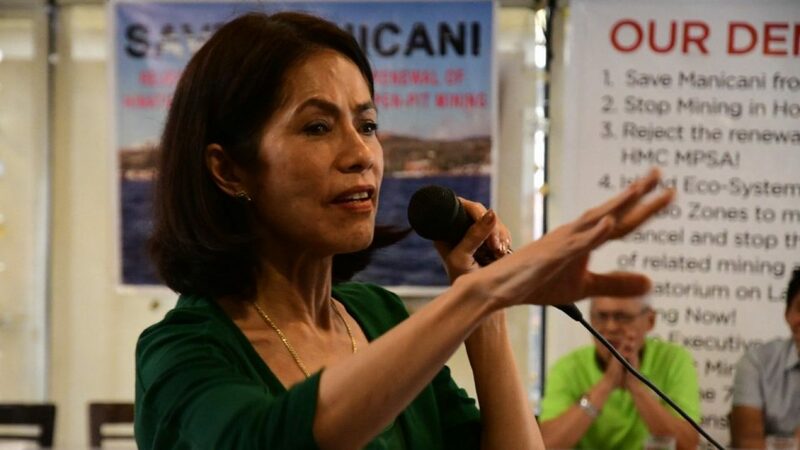 Former environment secretary Gina Lopez and other environment and renewable energy advocates expressed support for the 300-peso tax to be levied on coal. Lopez lauded the initiative of senators who support bigger taxes for mining and coal, like Senators Joel Villanueva, Ralph Recto and Loren Legarda. “We are the only country in the planet that gives a 7-year tax holiday for the destruction of our environment wherein 95% of the net income goes out of the local environment. Enough is enough,” Lopez said. Clean energy advocates were quick to address the fears being spread by coal proponents that taxing coal will increase electricity costs in the country, saying that the coal tax will force these coal oligarchs to finally pay their due. “What will raise the price of electricity is not the coal tax per se, but the passing on of fuel costs to the consumer enjoyed by coal plants,” said Center for Energy, Ecology, and Development Executive Director Gerry Arances. “Removing the pass-through provision in the present energy law which allows this will protect consumers from taking the hit in levying taxes against the coal industry,” he continued. Arances said that electricity consumers and energy poor communities may be the first to benefit from the coal tax if it is pursued in the right way. “Just as the revenues from the excise tax on tobacco products are used primarily to fund health facilities, taxing coal may be allocated to address energy poverty issues and the shift to cleaner renewable energy alternatives,” Arances said. Multisectoral coalition Sanlakas denounced the fear-mongering by coal proponents like Semirara chair Isidro Consunji, as well as their counterparts in the Senate. “Now that their coal addiction is being threatened, they are mobilizing their allies in the Senate to stall and defeat the bill,” Pedrosa pointed out. “Taxes on emission-intensive industries, mining, and coal are long overdue,” said Sanlakas Secretary-General Atty. Aaron Pedrosa. “It is detestable how coal proponents like Isidro Consunji of Semirara are threatening the consumers with higher electricity prices once the coal tax is passed, when they have been the ones profiting heavily and without risk because of the incentives shouldered by the citizens,” Pedrosa added. “Imposing taxes on coal is tantamount to saying there are no more free rides for coal oligarchs,” said Pedrosa.